Shocking claims of growth in government abound. However, viewed in context of the economic, demographic, and societal changes that have occurred over the last fifty years, the growth in government is far less astounding than the sound-bite statistics indicate. For example, the charge of 5,000% growth in state government is based on the change in total state expenditures since 1962. Over nine-tenths of this growth is due to inflation*; items cost much more today than they did fifty years ago, so state government (and everyone else) must spend a lot more to purchase the same quantity of goods and services. Population growth explains about half of the remainder, as state spending must expand to provide public services to a growing number of people. 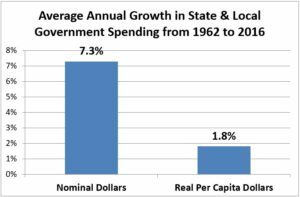 From 1962 to 2019, real (i.e., inflation-adjusted) per capita state government spending has increased by about 280%—which translates into an annual average growth rate of 2.4%. Annual growth of 2.4% is nothing to sneeze at; however, this amount too needs to be viewed in context. In early 1970s, state leaders—on a bipartisan basis—made a concerted effort to reduce property taxes by directing more state aid to schools, counties, and municipalities and by providing direct property tax relief to homeowners and renters through a series of reforms known collectively as the “Minnesota Miracle.” In the late 1990s—also on a bipartisan basis—the state again reduced local property taxes by increasing state aid to school districts, culminating with the near-complete state takeover of general education funding and the virtual elimination of the general education levy during the 2001 legislative session. In that same session, the state assumed a greater share of transit operating costs, which also had the effect of reducing local property taxes. The resulting growth in state spending did not represent growth in the overall size of government, but merely a transfer of funding responsibilities from local governments to state government. In order to get a more accurate picture of government growth that accounts for the shift of funding responsibilities between levels of government, we need to examine combined state and local government spending. The most current year for which combined state and local government spending is available is fiscal year (FY) 2016.† From 1962 to 2016, total real per capita public spending in Minnesota increased by about 160%, which translates to 1.8% average annual growth. But even this amount must be considered in context. For starters, in 2008 Minnesota voters approved a constitutionally-dedicated increase in the state sales tax to “protect drinking water sources; to protect, enhance, and restore wetlands, prairies, forests, and fish, game, and wildlife habitat; to preserve arts and cultural heritage; to support parks and trails; and to protect, enhance, and restore lakes, rivers, streams, and groundwater.” The language of this “Legacy Amendment” mandated that the tax increase could not be used to pay for existing public expenditures, but must fund new initiatives. Special need students are now “mainstreamed” into public classrooms. In addition to instructional costs, the medical care of special need students during the school day is paid for by the public. All-day kindergarten is provided at public expense. “All-day K” is widely recognized as a smart public expenditure that provides a high return on investment. Medicaid pays for the long-term care of the elderly and disabled. The state’s aging population contributes heavily to growth in these costs. Approximately half of this cost is borne by state and local governments. Public spending for environmental protection and remediation and natural resource preservation increased, as public awareness of the threat posed by pollution to the natural environment and human health grew. In many instances, public dollars are used to clean-up messes created by the private sector, with the goal of attracting private reinvestment that creates jobs and stimulates growth in the tax base. Most Minnesotans do not want to return to the era when the needs of disabled students were ignored by our public schools. Nor do they want to deny any child access to all-day K. Nor do they want a polluted environment. Nor do they want Eurasian milfoil, zebra mussels, Dutch elm beetles, Asian carp, emerald ash borers, and other invasive species to wreak havoc on our waterways and forests. Nor do they want to assume the financial burden of caring for a parent with dementia or for a severely disabled child or sibling without the benefit of a public safety net. Awareness of growth in public spending is essential to sound fiscal management. However, spouting selective statistics about “rampant growth in government” without reference to the changes in society and public preferences that have largely driven that growth is the hallmark of a political ideologue, not a fiscal conservative. *Per the recommendation of the Minnesota Council of Economic Advisors, the adjustment of state and local government expenditures for the effects of inflation is based on the Implicit Price Deflator for State and Local Government Purchases. This is the appropriate index to use for this purpose, for reasons described in a 2016 North Star article. †The best source of information on historical levels of combined state and local government expenditures is the U.S. Census Bureau’s annual reports on state and local government finances. The most current report in this series covers FY 2016. Calculation of per capita spending levels used here are based on a 1962 population estimate interpolated from the 1960 and 1970 censuses and the 2016 intercensal estimate from the Census Bureau.